When I saw the set pictures, this set said to me "main characters for cheap," and that's about it. 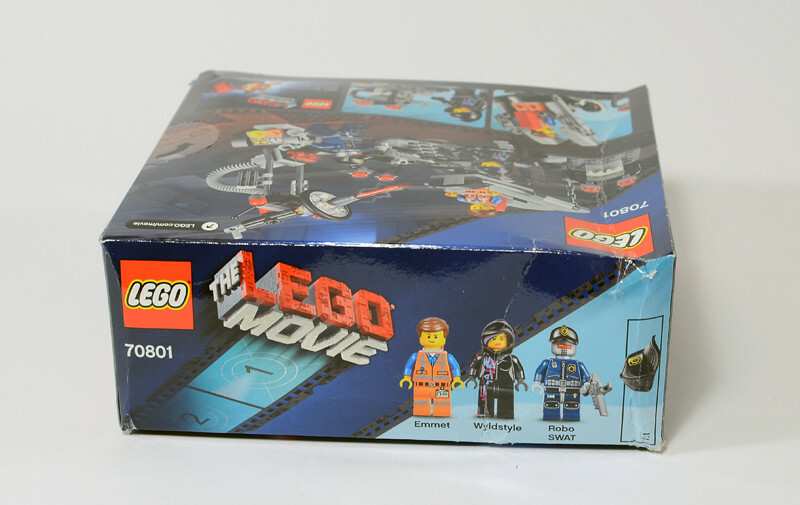 You wouldn't get Wyldstyle's hair, but you could get that in the minifigure series if you wanted to, so this set was still about getting the main characters in the cheapest set possible. Well, does it turn out to be a more worthwhile set than just that? 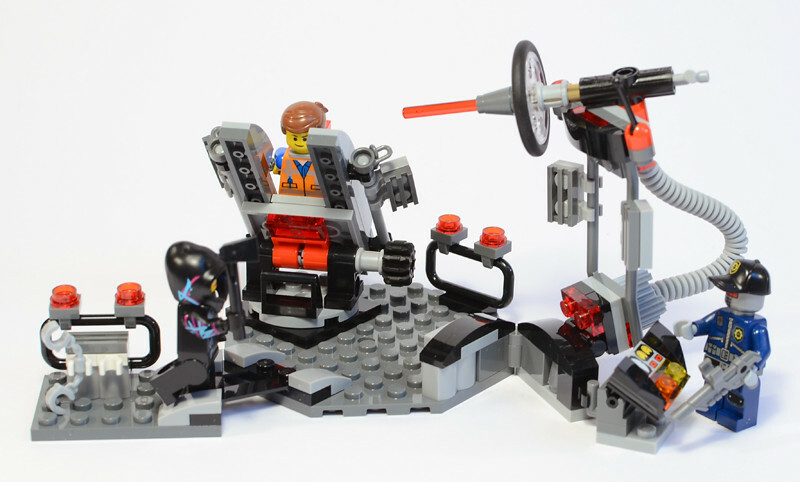 The actual build in this set certainly doesn't seem all that exciting from the picture here. My eyes are mostly drawn to Wyldstyle's hood. 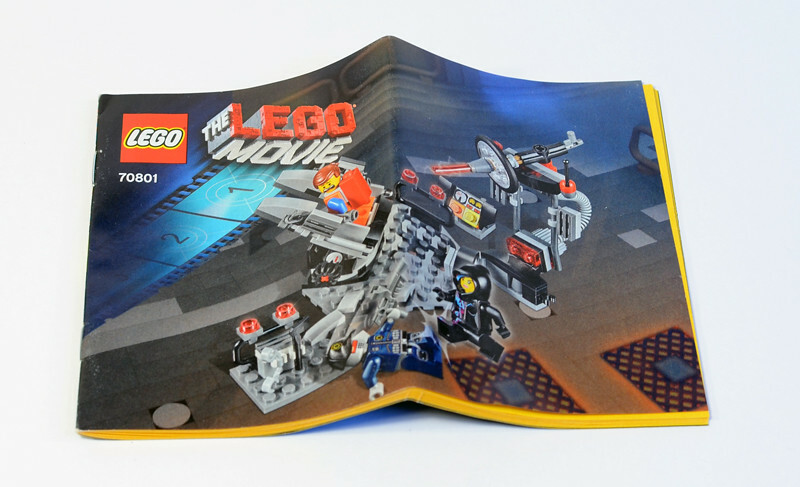 The back again seems to emphasize the minfigures, although it does show a few configurations of the set. 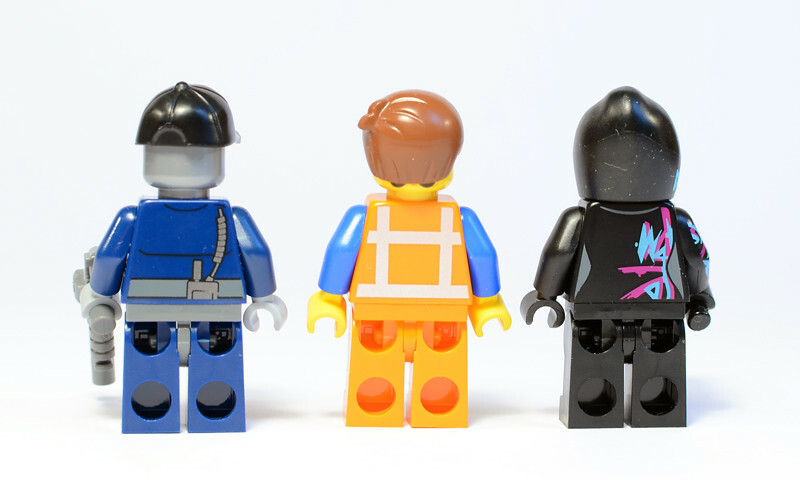 The top uses the cap piece for the 1:1, and gives us the character names we probably all know: Emmet, Wyldstyle, and a Robo SWAT. 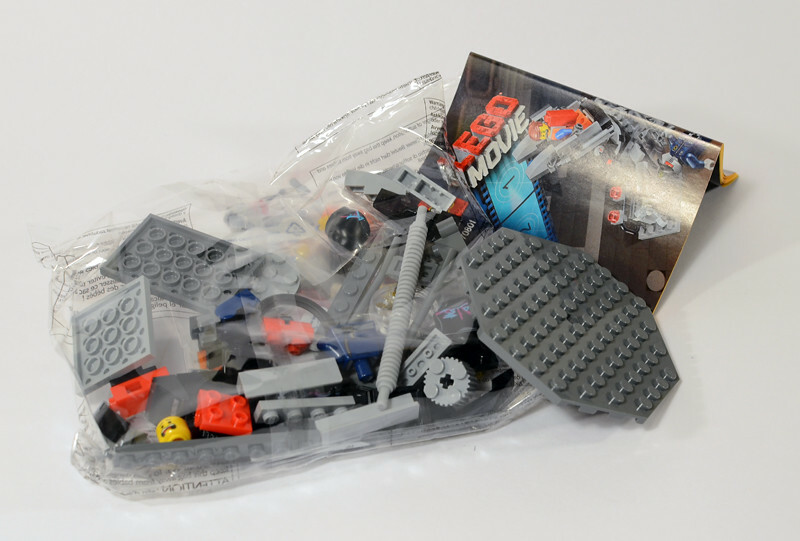 Just a couple small bags in there, along with the loose bigger piece and a folded up instruction booklet. The artwork on the set makes it look like this "room" is inside a much bigger room, just like the Lair art in fact. And this is what inside the booklet looks like, woohoo! The hoodpiece of Wyldstyle is cool if perhaps limited in use. Like I talked about in my Super Cycle Chase review, the Robo SWAT are excellent and make you want to have a whole force of them. This is the only set that includes the Super Secret Police logo cap, and it's the mould that was introduced in the collectible line, so that's extra cool. Emmet is Emmet. This is Wyldstyle's more cheerful face; she has a reverse slightly angrier one that I didn't photograph this time (but you can see it in my Cycle review, I believe). Everybody has nice back printing, and Wyldstyle has arm printing (which means her torso comes from "elsewhere" and she's got moulded numbers on her wrists and no neck printing). Wyldstyle is armed with an axe, and the Robo SWAT has the excellent new gun these Robo guys like to use. Since I haven't actually talked about it in any of my other reviews, here's Emmet's special brick (the piece of resistance?). It's like a two-tall brick with the back of a headlight brick in it. 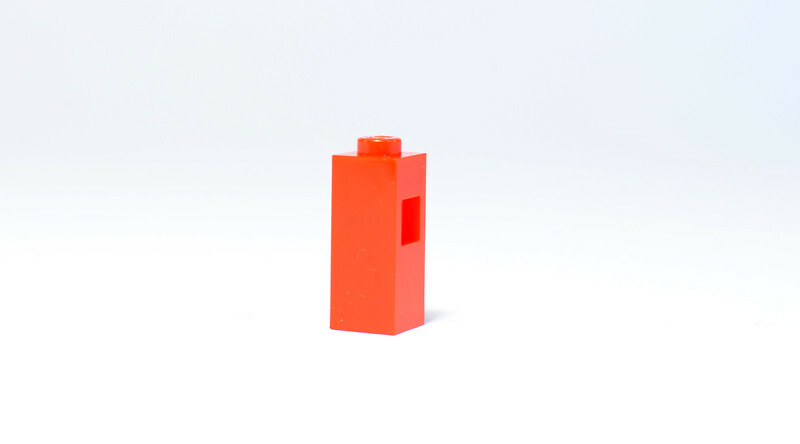 Will this be useful to builders? I dunno. Probably, since the AFOL community is quite creative with parts. Nothing too exciting here, besides maybe the nozzle. The nozzle is nice. So here it is. Unlike my ho-hum thoughts about it from the pictures, it's actually kind of fun in real life. 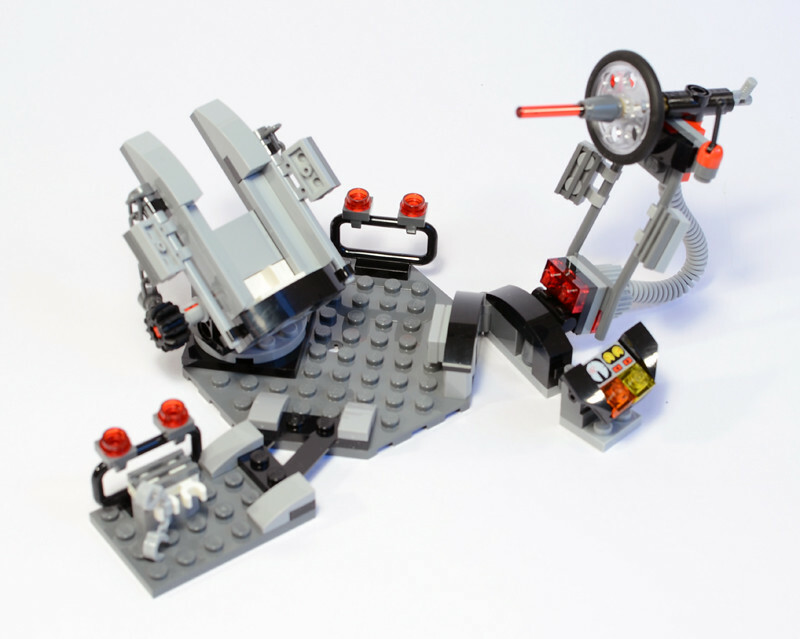 You can swivel the big melting gun and control panel around, and strap figures down to the torture bed, which also moves up and down. The color scheme doesn't pop, but there are good parts in here and it looks nice for what it is. I'm not sure what different angles really do to show this set - you can basically see everything from all angles. Good parts in here - the new a-frame piece, 1x2 slopes, the Cars bumper slopes in black, a trans-clear technic wheel. And no stickers! It's a lot more fun with the figures. 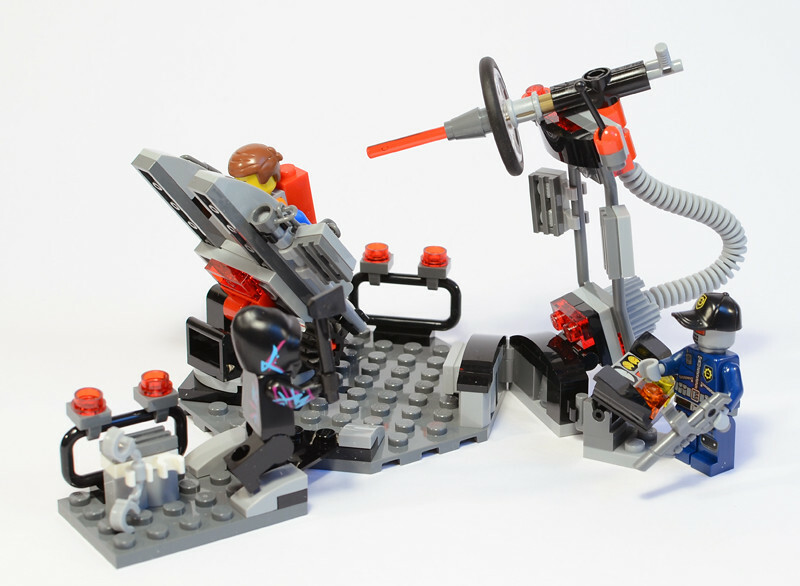 I can easily see a kid having a bunch of fun with this set. All in all, Melting Room is a surprisingly good little set, surprising because I thought it didn't look so hot before I opened it up and built it. It doesn't scream buy as much as its sister set in this price range, Getaway Glider, but it's still worth picking up. 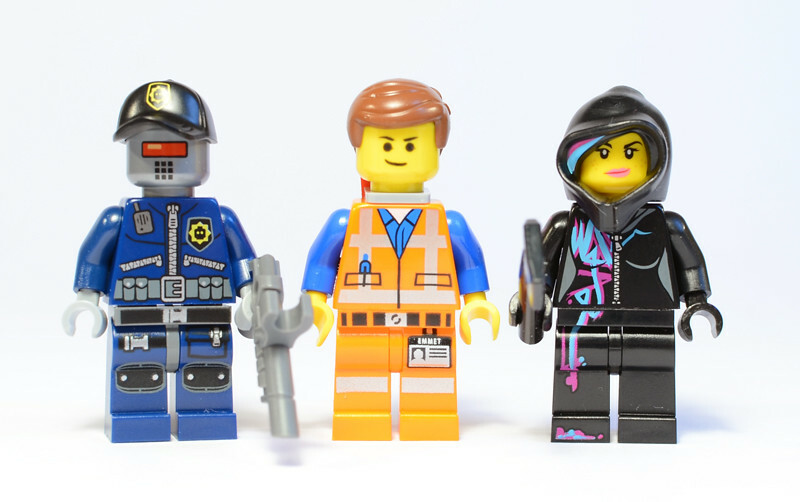 The minifigures are good, especially the Robo SWAT. The model is pretty fun and looks good for what it is, but of course a little drab. The designer worked in some desirable parts, so for people looking for good parts, this has some. It's maybe not an instant buy, but since it's cheap, it'll probably call out to you from the store shelves after a while. I'm not a big fan of this theme, and I think this is one of the dullest of the bunch. Wildstyle's hood is a great piece that I don't think has been released before, but the paint limits its uses in MOCs. Meh. I feel this set is missing some colors. The Movie set line is generally so colorful and for this one we get just some grey and black which is not really exciting, even for a small set. 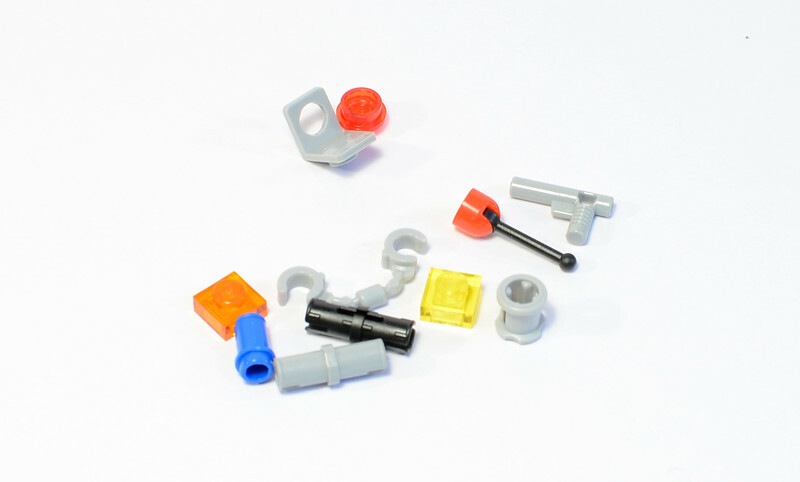 In the special pieces, I see that the set includes the new 45° angle piece which is a piece I look forward to have. 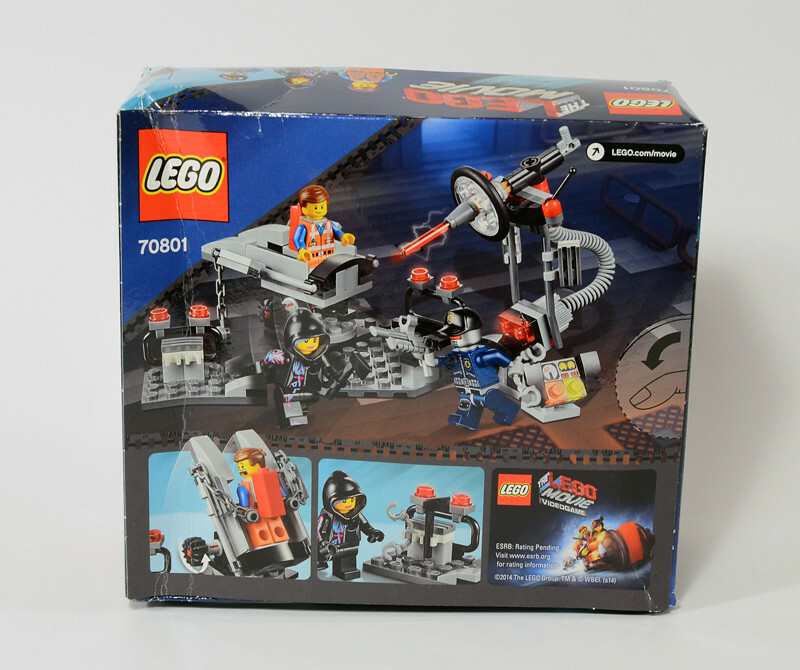 My kids have just got this with some Christmas money, along with the Robot sheriff set. It's a great little build and they're delighted with it. It works well with other baddies - great for superheroes or agents for example - and it's a reasonable price too. Clone O's review does it justice, as always. Eh, this set isn't that good. It really only exists as a cheap way to get the main characters. This look's great! First thing I thought when I viewed the set, much like another members comment about it's versatility, was "That'd be great for a Superheroes AIM lab to cut Iron Man out of his suit". 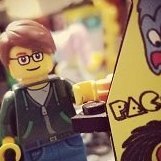 Sure, I'm not going to lie, the Mini figs look great and play a large part in me buying the set. With the increase in price of the CMF's I'm likely not to buy any of them, and I'll wait for Amazon discount's for most of the line , so this will get me the two main Characters for cheap, and a useful set. Great reviews Clone O'Patra! using 4 wings instead would have easily made another flying 2-in-1 model possible. the designer did really not put any effort into this one. Ugh... That cool hood piece looks terrible from this perspective! Well, a 2-in-1 model for this scene from the movie wouldn't have made as much sense as with the civilian vehicles. 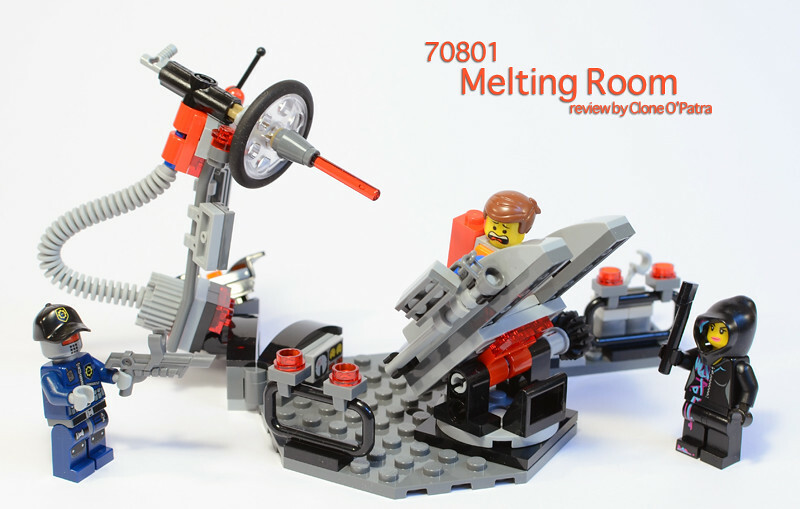 After all, the "melting room" is clearly a tool of Lord Business, and he's the one the people of Bricksburg are rebuilding their vehicles to fight against. I don't think there's a lack of effort with this set necessarily, but it does disappoint me in a few ways. For instance, in the movie, the laser in the melting room seems to be an actual life-size laser pointer (unless that's supposed to be a different laser), kind of like how the Kragle is an actual life-size tube of Krazy Glue. This fact isn't readily apparent in this set, unlike the Kragle in Lord Business's Evil Lair. I imagine some of this set's limitations were just to meet this price point. After all, there doesn't seem to be a lot of detail in the melting room that would demand a larger set. But at the same time, it seems to lose a bit of that gloomy atmosphere due to its "open" design and color palette. After all, there doesn't seem to be a lot of detail in the melting room that would demand a larger set. But at the same time, it seems to lose a bit of that gloomy atmosphere due to its "open" design and color palette. Compared to most of the other sets in this line, this one seems pretty gloomy just because it's all grey, black and trans-red. It seems pretty industrial to me. I think the designer definitely did as best he or she could on this one, and it's ok in real life, but not magnificent. Like I mentioned, designing a piece of a room that's actually in a bigger room must always be a challenge and ends up kind of strange no matter what. Even with the Lair you can feel that it's not the 'whole thing,' but that set looks great nonetheless since it has the scale to pull things off. 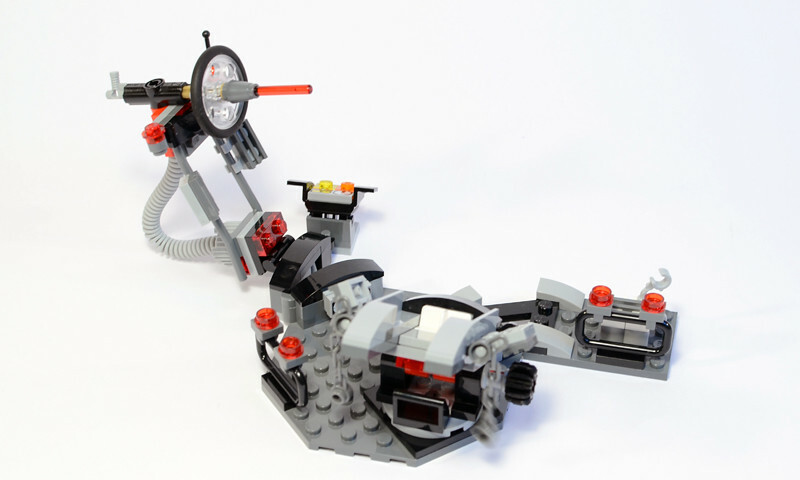 I thought this was a fun little set and a nice James Bond-style death trap (straight out of Goldfinger, which I imagine will be referenced in the movie during whatever scene this pops up in), and I'll have fun displaying various minifigures in it. For instance, I really want to see if I can concoct a decent John Wilkes Booth and have him turning the laser on Abraham Lincoln. 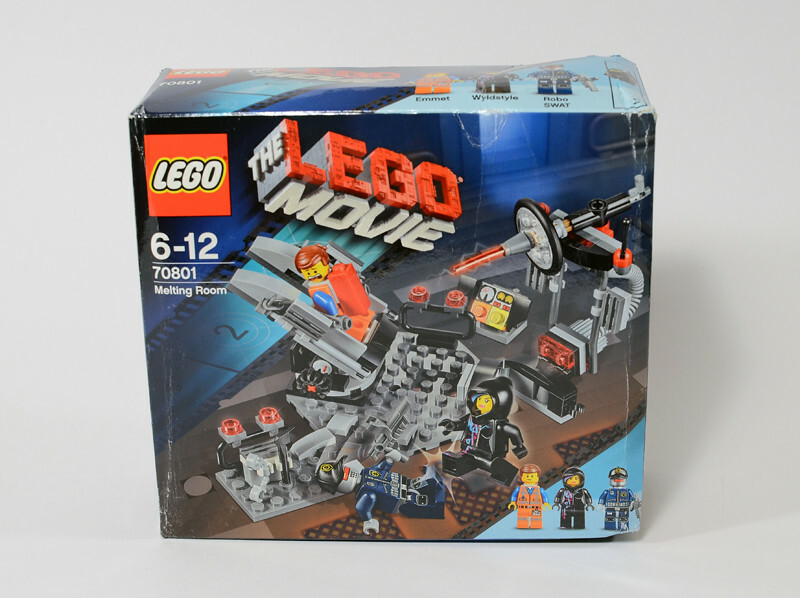 Can for this set to be attached to other Lego Movie set like: Lord Business Evil Lair?